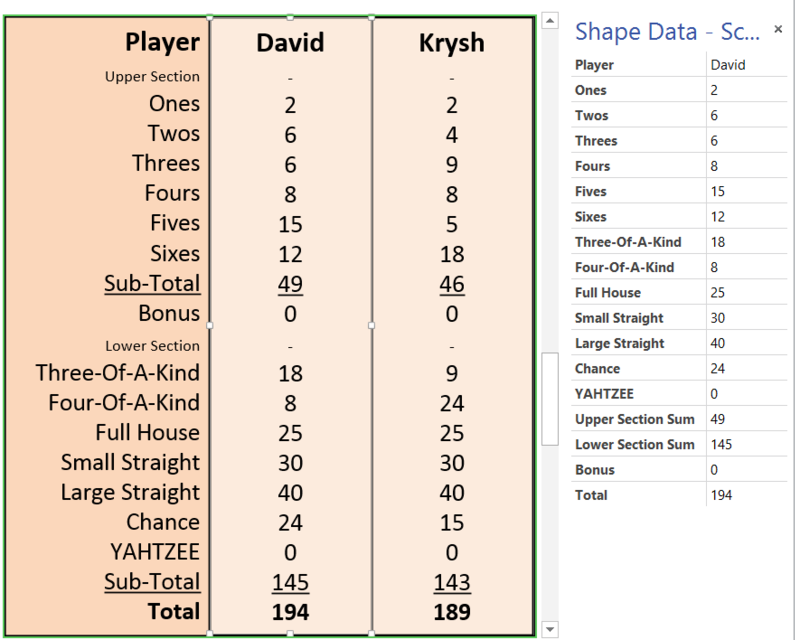 The holidays are almost over, so I now present my Yahtzee game in Visio just using ShapeSheet formulas …. no VBA or add-in! Pretty soon, I will have a whole compendium of games, but I think this is my most complete yet. Yahtzee is very similar to Poker Dice, but we used to play Yahtzee a lot as kids, so maybe I am regressing. 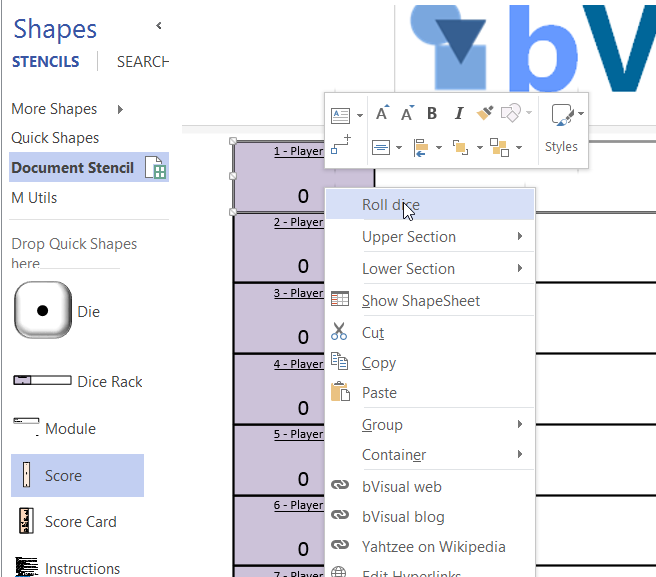 Anyway, setting these games up in Visio demonstrates the power of the ShapeSheet functions, which is necessary for the creation of efficient Visio shapes. I have also made the Dice Racks into List containers that can only hold the Die List Item shapes. In this case, there is a Die shape that can be rolled to get a random number between 1 and 6 and a Dice Rack to hold the dice and to calculate the score for the selected category. Each Dice Rack can be double-clicked, or Roll Dice selected from the right mouse menu, to add up to 5 random dice faces in the rack. You can double-click and die to roll it individually, or delete any number of die in the rack before rolling again, as above. 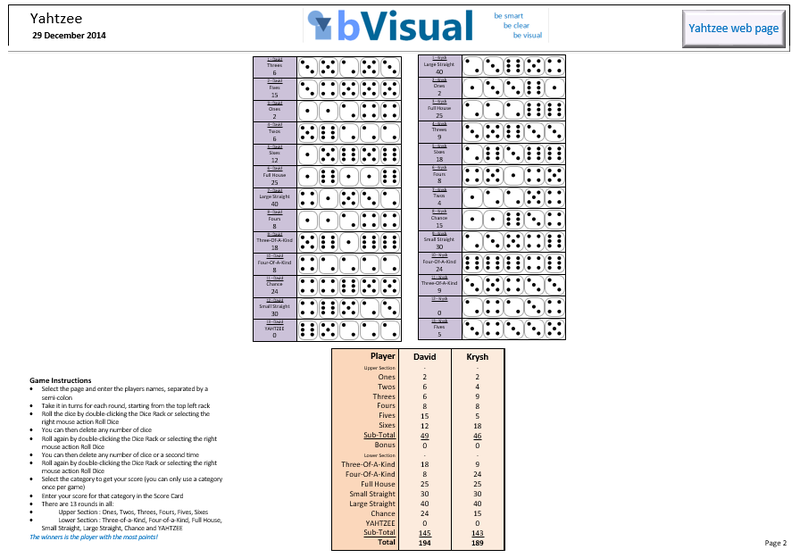 There is also a Score Card that automatically calculates the entered score for each category per player.